This page will take a little longer to load since it contains all of our on-line selections of tourmaline facet rough for all of the toumaline natural color varieties including; green tourmaline, blue tourmaline (indicolite), pink-orange-purple-red tourmaline (rubellite), watermelon tourmaline, and bi-color & multi-color tourmaline facet rough. NOTE: If the images on this page do not load properly (or if they take too long to load! ), then you should visit our Facet Rough Alphabetical Index where there are links to separate pages for each of the tourmaline varieties. The images of our faceting rough on these specific mineral variety pages will load much faster. Our tourmaline facet rough is sold and replaced on a daily basis, so do come back often! 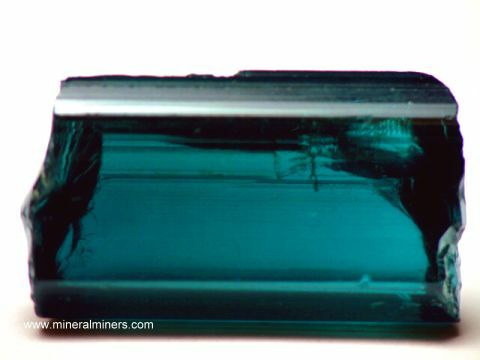 This slender gem grade tourmaline crystal has natural color zones; it is medium green at the base and then becomes blue-green towards the naturally terminated tip. It has not been heated or treated in any way. Theare some clay minerals still attached on some surfaces. This rare quality tourmaline is over 50% facet grade. This bi-color tourmaline crystal appears to be almost black, but when held near a light the beautiful colors are easily visible as shown. Natural Dark Green Tourmaline Crystal dimensions: 3.7" long x 0.5" x 0.4"
This 3.7 inch long natural tourmaline crystal appears to be black, but when held up to a light this rare quality tourmaline is actually a very dark green color at one end that grades into dark brown toward the middle and then into very dark brown (appears black) near the tip. This dark green tourmaline crystal is naturally terminated, and it has flawless gem-grade transparency in the green and brown portions when illuminated. This rare quality tourmaline crystal would yield 35 carats of flawless faceted green tourmaline gemstones, and 10 carats of flawless faceted brown tourmaline gems! The prismatic faces and the terminations are in very good overall condition. Our Tourmaline Facet Grade Rough is all 100% natural color! To see more tourmaline photos, just select another item category (such as Tourmaline Crystals or Tourmaline Jewelry) from the table below. To see photos of another mineral variety, select any item category link in our Mineral Inventory & Factsheet Index. We also have pages for facet grade rough for each of the tourmaline varieties including green tourmaline facet rough, blue tourmaline facet rough, and pink tourmaline facet rough. 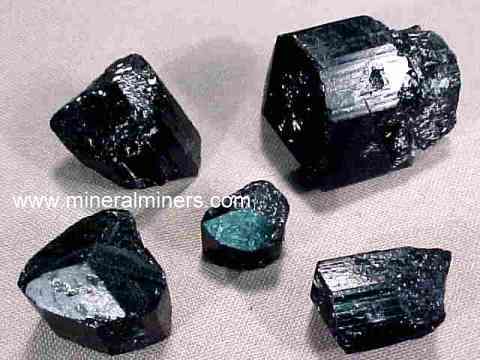 Would you like us to inform you when we add more natural tourmaline facet rough on this page? We have a limited inventory of natural tourmaline facet rough in stock, so be sure to let us know if you have any special requests. Please contact our webmaster or our 'site' geologist with any questions or comments.